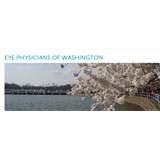 Eye Physicians of Washington (Washington) - Book Appointment Online! The doctors and staff of Eye Physicians of Washington look forward to caring for you and your family. With over 70 years of service to the Washington, DC area, our goal is to provide personalized, sophisticated care in a comfortable setting. We are privileged to care for you and your family. I loved everything about my experience with Dr. Green-Simms and the team at Eye Physicians of Washington! They were kind in answering all of my questions and gentle with the examination (i.e. the eye pressure machine). I'd highly recommend Dr. Green-Simms and her team for your eye exam and general eye needs.